Les Bleus had never lost to their opponents in nine previous attempts. MATHIEU BASTAREAUD WAS overheard by television microphones describing France’s shock 21-14 defeat to Fiji as “pathetic” and “shameful”. Les Bleus had never lost to Fiji in nine previous attempts and had won their six home encounters against them without conceding a first-half try. But scores from Semi Radradra and Josua Tuisova, coupled with three crucial second-half penalties from Ben Volavola, consigned France to a damaging defeat just 10 months out from the Rugby World Cup. 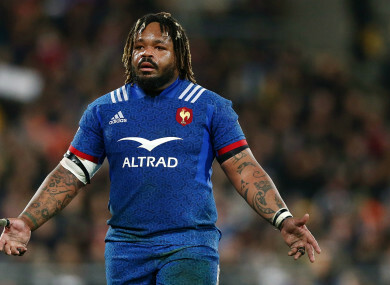 After the game, Bastareaud – who had taken over captaincy duties with two-try skipper Guilhem Guirado having been replaced – pulled no punches with the team in a huddle. “Who do we think we are? We beat Argentina and we think we’re something special,” he said. Head coach Jacques Brunel was similarly despondent about his team’s performance. Opposite number John McKee was understandably thrilled with a result that he believes will see his players go down in Fijian rugby history. Email “Bastareaud slams 'pathetic' and 'shameful' France”. Feedback on “Bastareaud slams 'pathetic' and 'shameful' France”.